It doesn't make a solid enough connection to the Teardrop when it's closed. It's too heavy, and I installed the hurricane hinge too short. 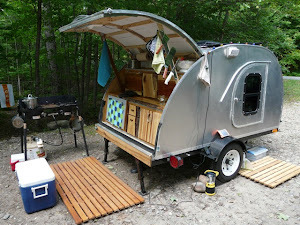 I've learned so much since building the Teardrop that the current hatch simply won't do. I fixed the hinge leak, but now there's a leak somewhere halfway down the hatch. Boo!! Hiss!! Now I could tinker with the hatch forever, but am I just putting off the inevitable? Shouldn't I just build a new hatch? I'm leaning strongly towards it. Right now I'm thinking the new hatch will have aluminum tubing for the frame and every piece of wood will be primed and painted with marine grade paint on all four sides. That's as far as I've gotten in the thinking phase, probably because it's overwhelming to think about. I've got until January to get it done. Six months seems like a very reasonable timeline. Oh yeah, but there's a To-Do List for the rest of my life, like building a solar kiln, finishing a micro-house on wheels I started last year, putting a metal roof on the shed, building an end-grain butcher block cabinet...You know, little things. It's Five o'clock - it's cocktail time! Sorry the hatch is proving to be a bigger problem. I am sure the 'next' hatch will work even better; sounds like you've learned what you need to do to make it work even better.